I was recently approached by someone from the aeternity group in telegram who said: wouldn’t it we amazing if there was a way to tip users for their help with AE ? 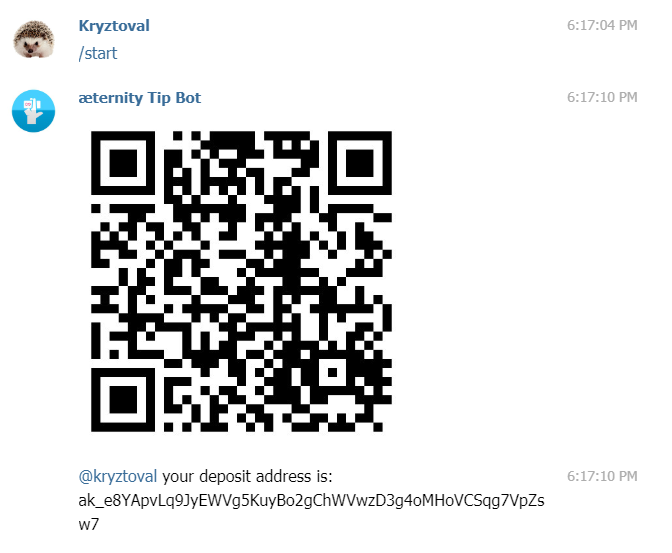 The bot is live in telegram, you can contact it @AeternityTipBot, you can add it to your group, or message it directly. You can ask the bot to show you your private key with “/getprivatekey” in case you want to make a backup of your wallet or use it in a different location. For security reasons the bot will refuse to show you the private key in a group, so please start a private conversation with the bot to get your backup key. You can send any amount of aettos (provided your balance covers the amount and the fee) to any public address, this is useful if you want to tip less than 1 AE, though we do not recommend it due to the current value of AE. To do this you use “/withdraw ak_account ammount” you can use the word ‘max’ as the amount to have the bot send you your full balance to another account. While I tend to make the server secure there are many things I can’t forsee and it wouldn’t be fair if I don’t warn you that, as with any hot wallet, you should keep the amount of AE you have in the bot’s wallet to an amount you feel confortable with and never use it to store a lot of money. Now we have a cool way to express our appreciation using the AE token. Great work. Great community member! I don’t know what forum software this is. Do you have that detail? the bot works in telegram, and it tips using the telegram username, not a wallet address. I am gonna check it out, and see if I can figure out how to do something that works with discourse. Hey @Kryztoval can we make the withdrawals from the bot to be in AE, not aettos? I think this will be more user-friendly.